Over the past decade the cost of communications driven by technological advances has dramatically decreased. Communications came to be accepted as a major driver of economic development and became essential components of the declared developmental targets by global assemblies. The 2005 World Summit on Information Society (WSIS) has ten global developmental targets. Target 10 is to “Ensure that more than half the world’s inhabitants have access to ICTs within their reach” (ITU, 2010, pp. 193). Among all the new ICT technologies, mobile cellular communications showed the most spectacular growth in the past decade, reaching a global penetration of 67 per 100 inhabitants in 2009 (Figure 1). 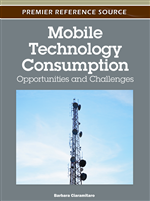 As a consequence of such rapid growth, supporting the development of mobile communications became the focus of many global efforts. The United Nations agency for telecommunications, the International Telecommunications Union (ITU), recommended for example in its 2010 mid-term report “Monitoring the WSIS Targets” the adoption of a policy of “expanding mobile network coverage in developing countries, particularly in rural areas” (ITU, 2010, pp. 207-208).